Cameron Crowe was 16 when he went on tour with the likes of Led Zeppelin, The Who and Iggy Pop. But in recounting the tales, Crowe turned to a most unusual source. 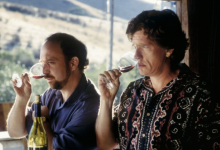 Sideways is more than just a funny, sad and honest study of encroaching middle-age and desperation. It’s also about the search for the perfect Pinot Noir. Synchronized sound arrived in 1927. But the theaters were far from silent before that and perhaps something was lost with the coming of the new technology.